123-RENAULT-4-A-V is a distributor, specifically targeted for the "Cleon"-engines as used in Renault 4, Renault 5, 4F4, 4F6, Renault Estafette and DAF55. It contains all the curves for carbureted-engines as originally specified by Renault. With a switch you can easily choose the advance-curve that was specified for your engine. 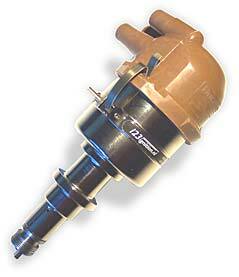 It comes with an angled distributor-cap, for easy access to the sparkplug-leads. Might you prefer an upright cap, specify a '123-RENAULT-4-R-V'. All units come with a built-in vacuum-advance sensor. The unique, "Formula-1", spark-balancing feature, makes your engine spin as if it was new ! The 123ignitions look original from the outside, but are real marvels of high-tech on the inside. The advance uses no moving parts, neither centrifugal weights, nor vacuum-membranes, and wear is therefore reduced dramatically ! The end-user can select one of 16 different advance-curves by means of a little switch in the bottom-face of the distributor-body. * it is the curve for the Renault 5 Alpine, but the 123-Renault-4-A-V does not fit mechanically!